I will try to keep this short and sweet. A while ago I was given an old Bear bow. It was nice and straight with no holes but had some battle wounds and a chip out of the shelf. After some research I found the Grizzly I held was made in 1966, the same year I was born ! This past summer I got the urge to refinish it. Alot of elbow grease and steel wool and sand paper and it was ready for some finish. After many coats of Satin Helmsman it looked real good. I had Chad @ LBR make me a string and ordered a replica Bear strike plate and feather rest for it.After adding some Red fox string silencers that Dimeit (Glen Mucha) gave me that match the wood in the riser I was ready to shoot it. To my amazement I shot it great !! Then it hit me the bow and I both turned 40 this year. I thought it would be great to take a deer with the old Bear. 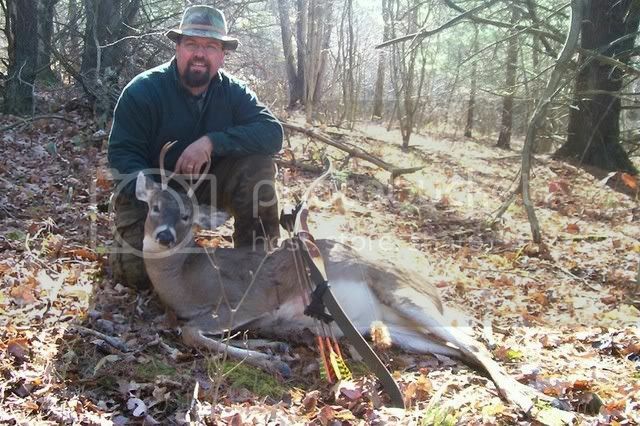 My thought was to shoot a buck with my custom bow and then try and take doe with the bear. I made up a 1/2 dozen cedar arrows with my turkey feathers that Charlie Lamb ground for me and traded for some old Bear razorheads with Olegreen to complete the package. When our bow season opened I decided to take the Old Bear out first then switch to my other bow. The old Bear just felt right in my hand and each time I headed out I would grab it. My wife doesn't like me hunting alone and would ask who are you hunting with today. My reply was Fred. Fred and I became real close and I all but forgot about my expensive bow hanging on the rack at home. My father and I took last week off to spend at our camp and deer hunt while the rut was starting. On Thursday morning it all came together when this little buck came in to visit a doe near my stand. As I dressed him out with the knife that Swampbuck won at Shawn Leonard's Bunny Hunt and gave to me I had alot to be thankful for. Good story! I have an old Bear Black Panther that I like to take out every once in a while. I got my first buck with it and I will always have a place for it. Great story. Nice Buck. That's what it's all about.